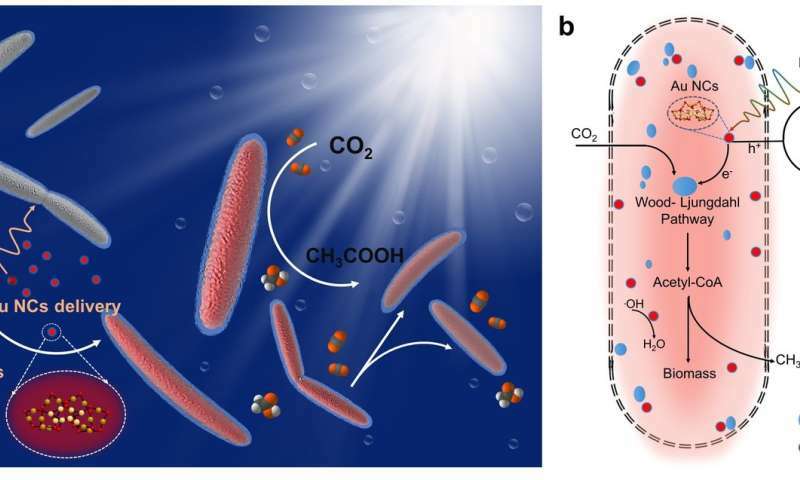 M. thermoacetica first made its debut as the first non-photosensitive bacterium to carry out artificial photosynthesis in a study led by Peidong Yang, a professor in UC Berkeley's College of Chemistry. By attaching light-absorbing nanoparticles made of cadmium sulfide (CdS) to the bacterial membrane exterior, the researchers turned M. thermoacetica into a tiny photosynthesis machine, converting sunlight and carbon dioxide into useful chemicals. Now Yang and his team of researchers have found a better way to entice this CO2-hungry bacterium into being even more productive. By placing light-absorbing gold nanoclusters inside the bacterium, they have created a biohybrid system that produces a higher yield of chemical products than previously demonstrated. The research, funded by the National Institutes of Health, was published on Oct. 1 in Nature Nanotechnology. For the first hybrid model, M. thermoacetica-CdS, the researchers chose cadmium sulfide as the semiconductor for its ability to absorb visible light. But because cadmium sulfide is toxic to bacteria, the nanoparticles had to be attached to the cell membrane "extracellularly," or outside the M. thermoacetica-CdS system. Sunlight excites each cadmium-sulfide nanoparticle into generating a charged particle known as an electron. As these light-generated electrons travel through the bacterium, they interact with multiple enzymes in a process known as "CO2 reduction," triggering a cascade of reactions that eventually turns CO2 into acetate, a valuable chemical for making solar fuels. But within the extracellular model, the electrons end up interacting with other chemicals that have no part in turning CO2 into acetate. And as a result, some electrons are lost and never reach the enzymes. So to improve what's known as "quantum efficiency," or the bacterium's ability to produce acetate each time it gains an electron, the researchers found another semiconductor: nanoclusters made of 22 gold atoms (Au22), a material that M. thermoacetica took a surprising shine to. "We selected Au22 because it's ideal for absorbing visible light and has the potential for driving the CO2 reduction process, but we weren't sure whether it would be compatible with the bacteria," Yang said. "When we inspected them under the microscope, we discovered that the bacteria were loaded with these Au22 clusters—and were still happily alive." Imaging of the M. thermoacetica-Au22 system was done at UC Berkeley's Molecular Imaging Center. The researchers also selected Au22 ¬- dubbed by the researchers as "magic" gold nanoclusters—for its ultrasmall size: A single Au22 nanocluster is only 1 nanometer in diameter, allowing each nanocluster to easily slip through the bacterial cell wall. "By feeding bacteria with Au22 nanoclusters, we've effectively streamlined the electron transfer process for the CO2 reduction pathway inside the bacteria, as evidenced by a 2.86 percent quantum efficiency—or 33 percent more acetate produced within the M. thermoacetica-Au22 system than the CdS model," Yang said. "Next, we'd like to find a way to reduce costs, improve the lifetimes for these biohybrid systems, and improve quantum efficiency," Yang said. "By continuing to look at the fundamental aspect of how gold nanoclusters are being photoactivated, and by following the electron transfer process within the CO2 reduction pathway, we hope to find even better solutions."